Like its predecessor, Bayonetta 2 begins in the middle of things, with the titular heroine locked in fierce, physics-defying battle against seemingly endless hordes of angels. Things take a turn for the ludicrous mere seconds in, as Bayonetta leaps into the cockpit of an oversized robot and trades her magically-enhanced martial arts for pneumatically-assisted punches and guttural chaingun bursts. From there the game sprints into a running battle with angelic hordes that wrecks dozens of city blocks and ends with Bayonetta sprouting raven's wings to throw down against one of her own hair-spawned demonic dragons! Everything you need to know about Bayonetta 2 is contained in these first few moments: It's a grand sequel that overshadows the most gleefully over-the-top aspects of its predecessor with entirely new levels of awe-inspiring spectacle. To the credit of developer Platinum Games, Bayonetta 2 is more than just striking set pieces. Much more. It mates a wholly new plot filled with style and panache with inspired aesthetic design and gameplay that is immediately inviting, rewarding and deceivingly complex in all the best ways. Bayonetta 2 is a cocky shout of giddy triumph that goes a long way toward erasing all memory of those long, barren months following the Wii U's debut. Nothing in the Bayonetta universe should work in a tense, third-person action game, especially given that our heroine finds herself caught in the midst of an unending, apocalyptic battle between the forces of heaven and hell. In one moment Bayonetta 2 might pit you against legions of golden-armored angels and physically improbable demons, and in the next we see Bayonetta strike a pose for an unseen camera following a particularly impressive attack string. Regarding the plot, Bayonetta's universe is the sort of deadly serious fantasy scenario common to action games, but just beneath that surface lies an entirely silly cast of characters and story beats. Bayonetta is a posh British witch who dual-wields pistols on both her hands and feet, and when machine gun firepower isn't enough, she uses her magical hair (which doubles as a skimpy catsuit) to manifest giant nightmare creatures with a taste for nearby enemies. Surprisingly, none of this outré weirdness is played for irony or winking irreverence. Bayonetta 2 exudes a swagger that other superficially similar games lack. It's more confident in its merits as an object of entertainment. Bayonetta 2 seems to sneer and say, "I know I'm cool, are you?" Bayonetta wears action hero cliches like a badge, but she does so with such aplomb, passion and over-the-top bravado that all the overused gimmicks that make most action games rote are drowned in a pure, giddy sense of fun. How does Bayonetta 2 accomplish this improbable balance of the strange and entertaining? Simple: It's all built on a core of granite-solid mechanics. Every button tap yields an immediate, crisp response, dodging blows is both intuitive and enthralling, and the game's combo system features so many branching permutations that it's impossible to tap a string of attacks that won't result in massive damage, an impressive combo animation and a bombastic finisher. It's easy and entirely viable to play through Bayonetta 2 by strictly mashing buttons, but the simplicity of combat and the engrossing violence that results from especially devastating attack strings invites even neophyte players to explore all the various combo permutations. Not only is mastery rewarded with higher scores at the end of each combat interlude, but the game doles out unlockable bonuses like a particularly generous house on Halloween. Bayonetta herself even poses for a post-battle photo op at times, driving home the game's tongue-in-cheek, "fun above all else" ideals. 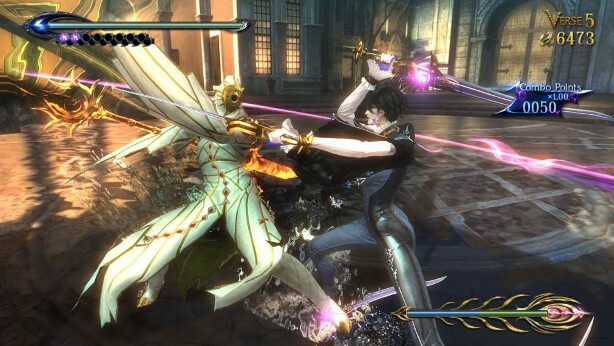 Her unlockable attacks and weapons (purchased using halos, as in the original Bayonetta) add even more complexity to the combo system as Bayonetta progresses, subtly encouraging players to wreck enemies with extreme prejudice for the precious, golden virtual currency that comes spilling out when they die. It's an addictive reward system that makes devoting time to learning the intricacies of combat worthwhile and fun. And that's before you account for the scoring system attached to each stage, which rewards you for being especially stylish and deadly, and encourages returning to older stages many times, even after you've dispatched the final boss and watched the credits roll. All of that could be said about the original Bayonetta as well, but our heroine enters Bayonetta 2 with a few new tricks up her magically hirsute sleeves. Owing to the series' jump to the Wii U, Bayonetta 2 features touchscreen combat controls that work far better than you'd expect. Tapping and cutting stylus slashes across the screen launches Bayonetta into combo attacks as rapidly and without fuss as using the face buttons. It even allows for added accuracy when attempting to pinpoint weak spots on certain bosses. I still prefer the traditional button-based control scheme (especially on the excellent Wii U Pro Controller) but for those who found their hands cramping in the original Bayonetta, the sequel offers a perfectly viable alternative to manic button mashing. As a bonus, it's minutely easier to activate Bayonetta's new Umbran Climax mode using touchscreen controls, but the Wii U GamePad screen feels slightly crowded in the enhanced torrent of violence it unleashes. 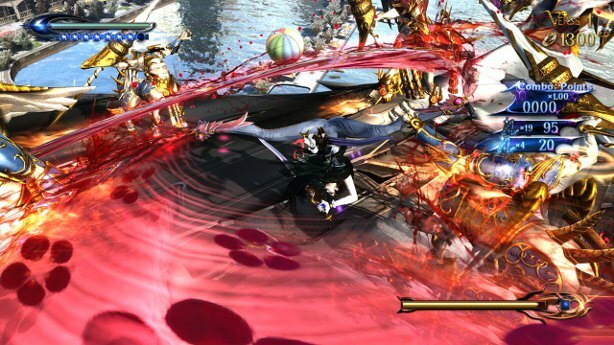 More notably, Bayonetta 2 adds online multiplayer in the form of pseudo-cooperative gambling. Whether you choose to play against someone you know or a random stranger, you're thrown into a series of six co-op battles where each player bets halos, both to determine the difficulty of your foes and the payout for victory. Prior to the game's North American launch, every online match I played was with a player located in Japan and after an initial 30-second load time, but I experienced no lag whatsoever. The single-player campaign remains the core draw of Bayonetta 2, but the online co-op is addictive, especially once you reach the later stages of the game's story and can bring some of your better equipment with you into online matches. On the technical side of things, Bayonetta 2 is gorgeous. Though graphical enhancements over the original Bayonetta are relatively minimal, the stylish art design is highlighted by the jump to the Wii U. In lieu of pouring on graphical effects, it seems Platinum Games focused on ensuring that the already undeniably attractive game should run as smoothly as possible at all times. Even in the most heated combat, slowdown is rare, and when it does rear its ugly head, it's minor and never jarring. The game's soundtrack is equally excellent, as it once again uses a classic lounge standard as a leitmotif for Bayonetta's especially awesome moments. In another game, that might seem overly precious, but it's hard not to grin at Platinum's dedication to this ridiculous universe. Bayonetta 2 is the perfect action game. It oozes style and boasts gameplay that's both refined and lacking in excess. The combat is so purely entertaining that it's easy to lose yourself in the almost-zen flow of dodging, countering and kicking enemies to death. Bayonetta 2 rewards a player's drive to look as cool as possible in combat with gameplay designed for exactly that – and with the acrobatic violence of a winking heroine who is as legitimately endearing as she is completely ludicrous. Even if Bayonetta 2 did not include an enhanced remake of its predecessor, it would launch as one of the Wii U's best games, but this generous inclusion pushes Platinum's first sequel into no-brainer territory for anyone with even the slightest affection for action games. If you bought the Wii U months ago explicitly in anticipation of Bayonetta 2, congratulations, your decision has paid off in spades. This review is based on an eShop download of Bayonetta 2, provided by Nintendo. The original Bayonetta was also tested. Images: Nintendo.